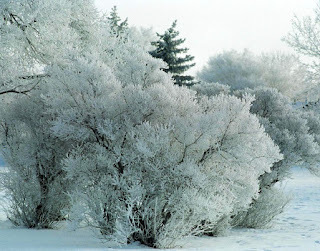 I wish that I had taken this picture as today was a spectacular prairie winter day in Regina; warm, sunny and frost covered trees much like this image. This was the setting when Joanne returned home from the hospital earlier today and set up in her comfortable sun room. Her five palliative radiation treatments are now complete and although she is extremely fatigued, she is otherwise generally OK. The plan at the moment is for Joanne to spend the next two weeks at home recovering from the radiation prior to any further intervention. Joanne continues to be very grateful for all of the emails, cards and written greetings she is receiving as they are always welcome and easy for Joanne to receive. Depending on the situation at the time, she may be able to take brief phone calls. At this time, please understand that visits are being limited to immediate family only. On behalf of her family thanks again for all of your support. Great news! Welcome home, Jo! Sounds like beautiful weather in Regina today.... and I can imagine you in your sunroom with the sun pouring in. Well done for getting through the radiation. I can't even imagine how exhausted you must be. So glad that you're home now, surrounded by your loved ones, and able to be in contact with all of us remote loved ones too. Let me know if you're up to a phone call. I'd love to talk to you. Yay for you!! Home at last! I'm sure you're resting in that beautiful sunroom. Happy the weather's so accomodating. Thanks for posting this, Darryl. Glad you're at home again Joanne. You know the things we've talked about and I'm doing what I can...Take Care sweetie and rest and you know where I am. Welcome home Babe, and I'm so glad you're done with the rads. I hope the weather is as nice there as it is here in TO because it's just beautiful to look at and you've got such a lovely view from that room. (You know I love a good snowy winter...) Soak up the beauty and and the love of all of us who are thinking of you. Home is where the heart is! I'm sure you're glad to back, all cozy and snug. Hope you're resting comfortably Joanne and the pain is manageable. Let the love of your family and friends carry you through this and know that our prayers continue. I am so happy to hear you are home - there is no place like it! You and your family are always in my thoughts. So glad to hear you are through the rads and at home in the sunshine. If the views are anything like the picture it must be wonderful to see. Hi Joanne, I am so glad to hear that you are back home enjoying the love of your family. I hope that there is lots of sun pouring into that sunroom and that you are able to soak it up. I continue to send lots of love and prayers and will probably attempt to call you soon. Rest well my good friend. Hello, Joanne. Home again! We were waiting to hear the good news - thank you, Darryl. Time to relax in your beautiful sunroom. As always, hoping you and your family can feel the loving thoughts, and good wishes going your way. May you now be entering an almost symptom-free plateau phase. Rest well. I am Pat- a friend of Joannes from University. Please pass along to her and Gord my well wishes. Remind her of the amazing time we had in Hawaii- and tell her I am picturing her there! Please give her a hug for me and tell her I love her.